How long will Annie Ryder be on the case? Has the Bellevue TV show been cancelled or renewed for a second season on WGN America? The television vulture is watching all the latest cancellation and renewal news, so this page is the place to track the status of Bellevue, season two. Bookmark it, or subscribe for the latest updates. Remember, the television vulture is watching your shows. Are you? 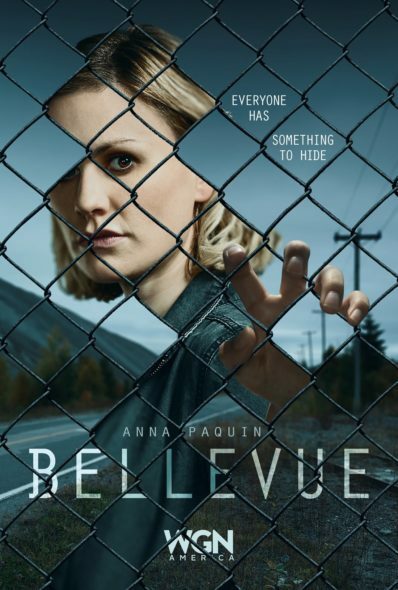 Airing on the WGN America cable channel Bellevue stars Anna Paquin, Shawn Doyle, Allen Leech, Madison Ferguson, Billy MacLellan, Sharon Taylor, Janine Thériault, Amber Goldfarb, Vincent Leclerc, Joe Cobden, Victoria Sanchez, and Sadie O’Neil. The Canadian crime drama, which originally premiered on CBC, centers on the disappearance of a transgender teen. The disappearance of Bellevue’s high school hockey star, Jesse Sweetland (O’Neil), evokes memories for Detective Annie Ryder, whose father committed suicide, after failing to solve an all-consuming case. In May of 2017, Bellevue was cancelled by CBC. Although WGN America no longer runs its own original series, could it come back in some form? Stay tuned for further updates. CBC cancelled Bellevue well before it ever premiered on WGN America. A couple of years ago, I might have been speculating whether WGN would save the crime drama on its own. Parent company Tribune Media, however, ditched all its original programming like cancelled TV series Underground and Outsiders, to be slim, trim and primed for a merger with Sinclair. The Bellevue TV series originally premiered on CBC in 2017. By the time it made its debut on WGNA in January of 2018, the cast options would have expired. For now, Bellevue is one and done, and I suddenly know what’s for dinner. Still, I’ll keep an eye on the trades, in case it makes an unexpected comeback. Subscribe for free alerts on Bellevue cancellation or renewal news. 3/13/2018 update: The Bellevue TV series finale, episode 1.08, “You Don’t Understand Me at All,” aired tonight on WGN America. Check out our show page, for more. Now, I feast. Check the rankings for WGN America’s scripted TV shows. Find more Bellevue TV series news or other WGN America TV show news. What do you think? Are you disappointed there will be no second season of the Bellevue TV series? Should it have been cancelled or renewed for season two? More about: Bellevue, Bellevue: canceled or renewed?, Bellevue: ratings, WGN America TV shows: canceled or renewed? Carter: Is the WGN America TV Show Cancelled or Renewed for Season Two? 100 Code on WGN America: Cancelled or Renewed for Season Two? Underground: Cancelled or Renewed for Season Three on WGN America? What the hell, WGN finally gets a decent series to watch “Bellevue” & it gets cancelled. What idiot is doing your scheduling? No wonder your ratings stay below everyone else’s! Please Renew this show, I love Bellvue!!!!!! Please renew this show, one of the best I have ever seen, enjoyed it so much! I loved the series, something other than a cookie cutter cop show. Very disappointed it will not be renewed, have a little FAITH in the show stars to pull off the characters they were great! Why would WGN run a series if it was already canceled???? Bellevue was interesting to say the least. Anna Paquin’s was perfect in her part as cop who would stop at nothing to solve her case, but was totally messed up as a wife and parent. If possible bring it back on Netflix or Hulu. I am very disappointed,in this show,being cancelled. Please put it back on. Please, bring Bellevue back for a second season & more. It was just released new as a tv series & didn’t get a chance. Give it a chance! It has a lot of fans. I loved the show! Now you are leaving us with another cliffhanger on another show leaving us in suspense & hanging! It makes me upset! All the best shows get taken off air! It’s not right! Only leaving us with boring or stupid shows that aren’t good & we don’t care about? Vote to bring Bellevue back on air. Thank u! You are absolutely correct. Like who cares about “Two Broke Girls” that is the dumbest show ever. S2 of Bellevue will boost your ratings. It’s one he’ll of a show with a strong fan base. Please renew. Hopefully there will be a second season. One of my top favorite shows. I’m really disappointed that there seem to be no plans for another season. It was amazing!